Giant Ragweed (Ambrosia trifida) is just one of the ragweeds causing hayfever symptoms this time of year. I haven’t seen any ragweed in my prairie for years, but this year I noticed several Giant Ragweed (Ambrosia trifida) plants — and only because they towered over the Ox-eye Sunflowers (Heliopsis helianthoides). I could hardly believe my eyes! There are several varieties of ragweed. All play havoc with allergy sufferers. Their light pollen floats in the wind, unlike the heavier pollen of the native plants that typically falls to the ground. This annual is difficult to eradicate with herbicide, so if you find some don’t let it get out of hand. Cut it before it goes to seed. Spring burning will also help keep it in check. 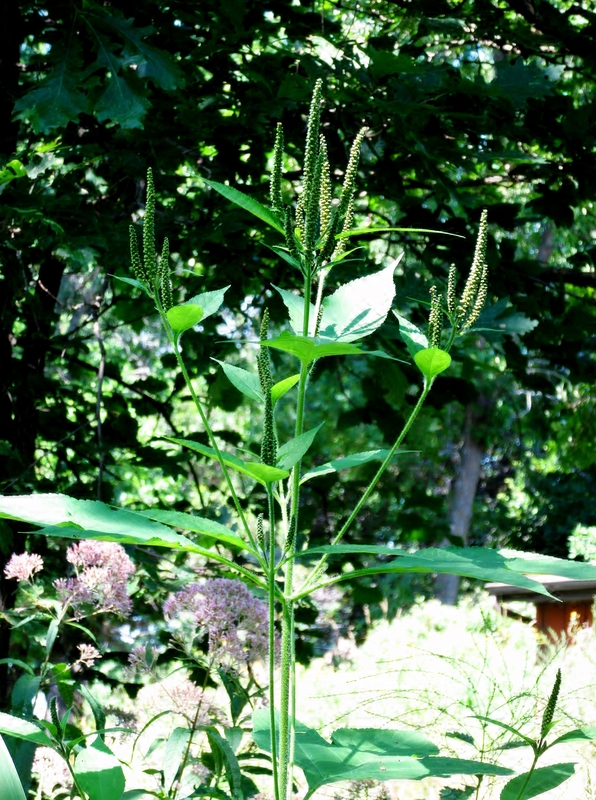 Want to know more about what plants to use in your landscaping to avoid allergic flareups? Read Right Native Plants in the Right Landscape Means Fewer Allergies by Tom Ogren.